Clean & Simple is the theme for this week's Stampin' Up! Only (SUO) Challenge. This card definetly qualifies using some basic dry and heat embossing techniques! I can't wait to use these cards as thank you's this holiday season and I'm sure to make more boxed sets as gifts. 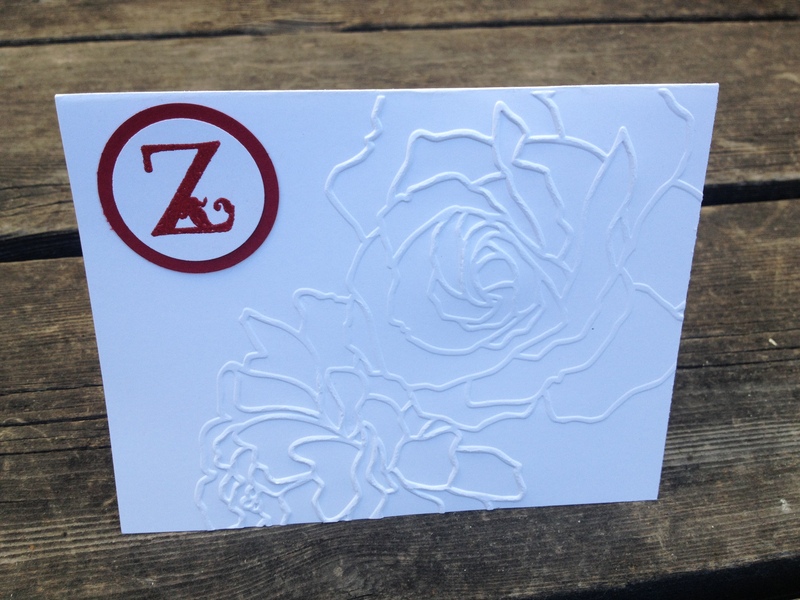 The Lovely Letters alphabet matches my favorite embossing folder, Manhattan Flower perfectly. This entry was posted in SUO (Stampin' Up! Only Challenge) and tagged big shot, embossing, Monogram card, stampin' up!, SUO, texture boutique on November 17, 2012 by katzcreates. Beautiful thank you card! I could imagine a whole pack of these for a give. Thanks for joining SUO Challenges this week. Definitely a clean and simple, but striking card! Great job with the SU Only CAS challenge…thanks for playing along!